Are you an independent contractor, that is, do you provide services to one or more businesses each year as a non-employee? If you receive over $600 in a year from an individual or business, the payer must provide you with a 1099-MISC form to verify your income to the IRS. Before preparing the 1099-MISC form, you must give your payer a valid taxpayer identification number. The form used for this information is a Form W-9. Form W-9 is a tax document that must be signed by independent contractors to provide a taxpayer ID number (Social Security Number or Employer ID). If the employer doesn't have a taxpayer ID, or if the taxpayer ID is incorrect, the independent contractor must have federal income taxes withheld, known as "backup withholding." Form W-9 is a standard tax document often utilized in business and financial transactions. So by itself, a W-9 doesn't pose many problems. Still, there are some simple issues to be aware of. 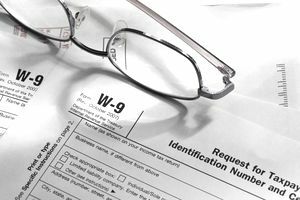 Because the Form W-9 is asking for your name, address, and Social Security or Employer Identification number, you should exercise caution in giving out that information. Be sure that you know who is asking you to fill out the form—and why—and how your tax information will be used. Form W-9 requires you to include information on your business type. Make sure you are entering your taxpayer ID correctly and that you are entering the correct taxpayer ID. This is the main purpose of the form, to verify this information. The questions come when your business is an LLC. A single-member LLC files federal income tax returns as a sole proprietor, and multiple-member LLC files as a partnership. You will be asked if you are subject to backup withholding. Most people are not, but if you have questions, see this article about backup withholding. You will be asked if you are subject to reporting foreign assets. Unless you have assets in a foreign country, this section won't apply to you. If you are starting a new job and your new employer hands you a W-9 to fill out, ask if your new job is as a self-employed contractor or as an employee. Employees fill out the Form W-4 to set their tax withholding level. Self-employed persons (independent contractors) don't have income taxes or Social Security/Medicare taxes withheld. You and your employer can discuss the issue of your status, but it's the IRS that ultimately decides whether a worker is an employee or an independent contractor (self-employed). If you are not sure about your status, read more about the difference between employees and independent contractors. The IRS wants to make sure all taxpayers are reporting all sources of income. So, they have instituted rules to make sure all W-9 forms have a correct and complete taxpayer ID number. If you submit a W-9 without a valid taxpayer ID, or if your tax ID is invalid, your employer will be required to withhold federal income taxes from your payments—backup withholding. What Year-end Payroll Tasks Must I Take Care Of?